Black Friday is November 25, the day following Thanksgiving (the fourth Thursday of November). Since 1952, it has been traditionally regarded as the most active shopping day of the year and it also starts the holiday season. We mention the holiday season for one good reason: around 30% of annual retail sales happen between Black Friday and Christmas. For some ventures, such as jewelry businesses, the percentage is even higher — nearly 40%. In 2016, the eCommerce revenue in the US surpassed Adobe Digital’s expectations of $3.05 billion by almost $300 million for a record $3.34 billion. Besides the financial side, it also contains a considerable 21.6% year-over-year growth rate. 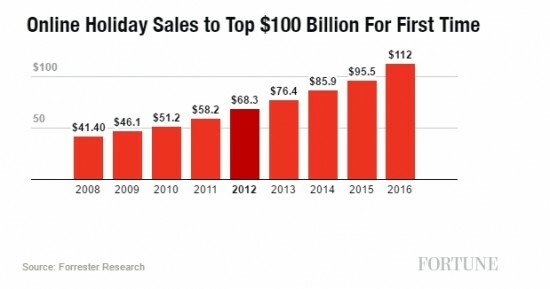 And what’s more important, according to Adobe, Black Friday 2016 was the first day in history to generate more than a billion dollars in online sales from mobile devices which is a 33% increase compared to the last year. 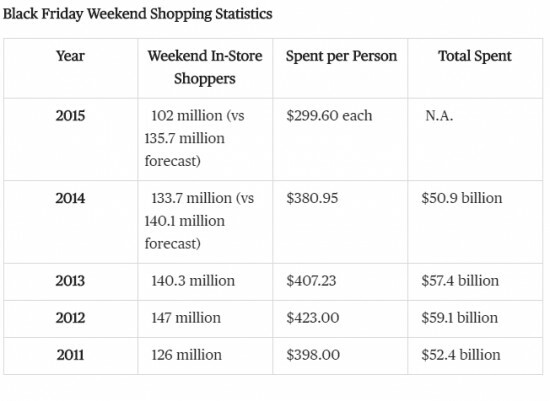 By the way, Thanksgiving Day also showed its best results ever on mobile, with a record of $449 million. ChannelAdvisor reported that smartphones accounted for approximately 70% of the overall traffic, with tablets making another 8%. ChannelAdvisor also stated that for the first time, mobile e-commerce orders surpassed desktop ones, with 53% of all orders on Thanksgiving Day completed on a mobile device. Out-of-stock items: The products most likely to run out-of-stock include Nintendo NES Classic, PlayStation VR bundle, PlayStation 4 Call of Duty Black Ops bundle, Beats Solo, Nintendo 3DS XL Solgaleo Lunala Black Edition and Xbox One S Madden NFL 17 Console Bundle for electronics. Discounts: The highest price drops were seen for tablets (average discount of 25.4 percent), televisions (23.2%), toys (15% and computers (11.6%). Video game consoles were sold for higher prices (3.2%) compared to Thanksgiving. And what about Cyber Monday? The mobile generated $1.07 billion in sales, a 34% increase over 2015, according to Adobe Digital Insights. 47% of all website visits came from mobile devices — mostly smartphones — and resulted in 31% of sales. Thus, it’s no brainer to conclude what does this all mean in terms of doing business. Mobile is the new king of retail. Undoubtedly, the mobile technology has brought lots of positive changes which were nearly impossible to imagine, say, 15 years ago. As the statistics above show perfectly, the mobile Internet help businesses to be more productive and profitable. And what does it all mean for regular shoppers? The answer is clear: most of the modern consumers are quite comfortable shopping from a couch or a kitchen table rather than physically going to stores like their parents did. Surely enough, businesses quickly realized the potential of mobile and heavily invested in their mobile presence. By way of illustration, Walmart – an American multinational retailing corporation – has just recently made significant investments in its application. The other intriguing fact is that they made a decision to offer certain deals exclusively via their app for the first time ever in 2016. All these measures showed quite interesting results: Walmart reported that mobile traffic comprised more that 70% of its Black Friday shopping. Walmart or not, it seems there was a significant increase in retailers targeting consumers via mobile apps in 2016. 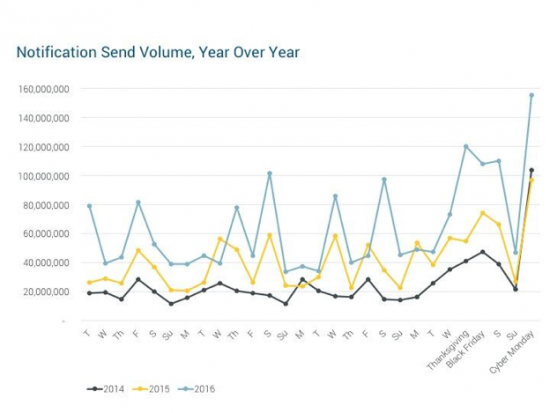 For instance, according to Urban Airship, retailers sent 56% more holiday notifications in 2016 than in previous year. The biggest trend of 2016 was the targeting. 88% of notifications were targeted to shopper’s locations, preferences and behaviors. Only 12% of these messages were sent to everyone. As for apps, on Black Friday itself, there was a peak of more than 1.2m app installs. If you think that mobile apps work solely for big names like Walmart or Starbucks, you better think again. Nowadays, more and more small and midsize businesses are following the mobile trend, because they understand that a successful mobile strategy requires a lot more than just a mobile-friendly website. In fact, many small businesses already have their own dedicated mobile app — the one you use in your daily life. These companies are ahead of the game when it comes to taking their marketing to the next level. For instance, brick and mortar stores that closed on Thanksgiving did not lose any business if they had a powerful online presence. Without any doubt, eСommerce will continue to take revenue share away from traditional stores in 2017. As the stats in this article clearly say, mobile devices are becoming the holiday-shopping weapon of choice and the mobile share of sales will certainly grow this year. In order to be prepared for the next Black Friday, make sure you have a well-designed app as it could be the game-changer for your business.